From Winnipeg, Man. 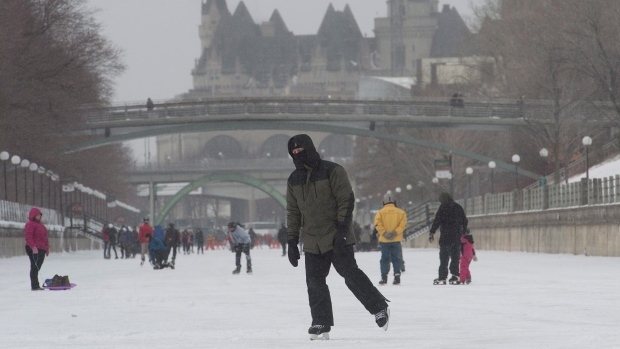 to Quebec's Eastern Townships, large swaths of Canada were under an extreme cold warning on Saturday as temperatures dropped deep into the negatives. Environment Canada issued Extreme Cold Warnings for the southern half of Manitoba, almost the entire province of Ontario, parts of Quebec, and parts of New Brunswick on Saturday. The agency also issued warnings for extreme cold and winter storms in areas of Newfoundland. According to Environment Canada, an Arctic ridge of pressure pushed temperatures in Winnipeg to a frigid -30 C overnight. Combined with 15 kilometre-per-hour winds, the city was expected to see wind chill temperatures of -40 C or colder. Meanwhile, in the City of Ottawa, "the coldest air of the season" was expected to cause wind chill values between -35 C and -45 C, and Torontonians faced wind chill values between -30 C and -40 C on Saturday morning. Even more extreme temperatures are forecast for Quebec on Saturday, with Environment Canada forecasting wind chill values between -38 and -46 for Montreal and Quebec City. Environment Canada issues extreme cold warnings when temperatures or wind chill create an elevated health risk. While under extreme cold warnings, the agency urges residents to wear appropriate clothing, dress in layers with a wind resistant outer layer, wear warm socks, gloves, a hat and scarf, and change into dry clothing as soon as possible if they become wet. While the agency said temperatures are expected to improve "marginally" on Saturday afternoon, they were expected to drop again overnight, before moderating on Sunday afternoon and Monday. Lac Benoit, Que., clocked the coldest temperatures in the country on Saturday morning, coming in at a chilly -46.3 C.
Meanwhile, Esquimalt Harbour, B.C. enjoyed a balmy high of 10.1 C.